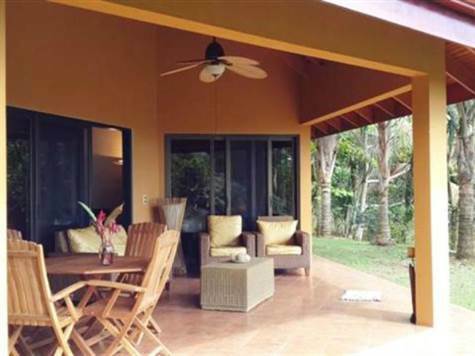 This private home in the mountains above Dominical features a tranquil setting, small ocean view, security, vaulted ceilings and cool temperatures while being close to the beach and all of the great services and activities. The home has an open living room dining area that directs your attention to the covered patio and the views beyond. Perfect location to place your pool and enhance the enjoyment of the home. The master bedroom and bath are smartly located on one side of the home from the two guest bedrooms with a shared bath. The cozy kitchen features a bar and is open to the living area - great for entertaining. There's also a large loft that would make a perfect home office and a garage that could easily be converted into a guest house if desired. The home comes fully furnished and at this price you won't find a better deal on the market.